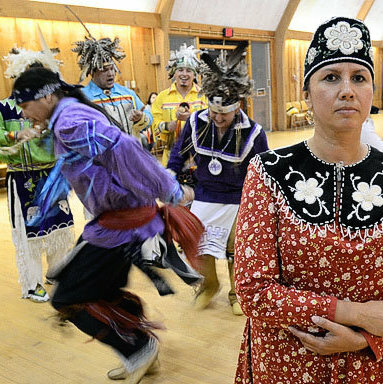 Sherri Waterman-Hopper, a member of the Beaver Clan of the Onondaga Nation, is the coordinator of the Haudenosaunee Singers and dancers who share perspectives from their culture through traditional social dances. She formed the group with her children over 20 years ago to teach people in a joyful, and positive spirit about the ways of her culture. “ People ask me if I live in a tipi, but our people never lived in tipi’,” she said. “It is these misconceptions that we want to be able to educate people about. Haudenosunee translates to “People of the Longhouse.” The Haudenosaunee Singers and Dancers travel throughout the East Coast and have performed in Canada and Japan. They dress in traditional regalia and are comprised are primarily from the Onondaga Nation, situated outside Syracuse, New York, although they can also include members from surrounding Native communities. The dances are non-ceremonial, but they give honor, thanks and acknowledgement to our natural world. Audience members will be invited to perform in each dance, making for a very interactive, educational and entertaining program. Called the Iroquois Confederacy by the French, and the League of Five Nations by the English, the confederacy is properly called the Haudenosaunee Confederacy. It was founded by the prophet known as the Peacemaker with the help of Aionwatha, more commonly known as Hiawatha. The exact date of the joining of the nations is unknown. Often described as the oldest, participatory democracy on Earth, the Haudenosaunee Confederacy’s constitution is believed to be a model for the American Constitution. What makes it stand out as unique to other systems around the world is its blending of law and values. For the Haudenosaunee, law, society and nature are equal partners and each plays an important role. The confederacy, made up of the Mohawks, Oneidas, Onondagas, Cayugas, and Senecas was intended as a way to unite the nations and create a peaceful means of decision-making. Through the confederacy, each of the nations of the Haudenosaunee are united by a common goal to live in harmony. Each nation maintains it own council with Chiefs chosen by the Clan Mother and deals with its own internal affairs but allows the Grand Council to deal with issues affecting the nations within the confederacy. The Haudenosaunee symbol of the long house, provided by the Peacemaker, is recognized in traditional geographic locations. Upon confederation each nation took on a role within the metaphorical longhouse with the Onondaga being the Keepers of the Fire. The Mohawk, Seneca and Onondaga acted as the Elder Brothers of the confederacy while the Cayuga and Oneida were the Younger Brothers within Grand Council. The main meeting place was and still exists today on Onondaga territory.